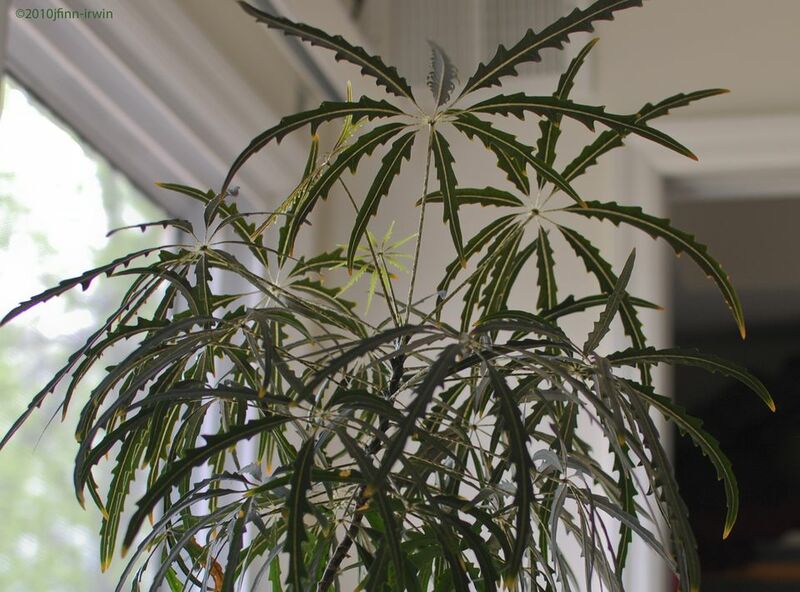 The false aralia was recently reclassified from the Dizygotheca genus and renamed Schefflera elegantissima, making it a relative of the popular Schefflera plants. Whatever their name, they have earned their position as a popular houseplant. Schefflera elegantissima have beautifully textured foliage, with deeply serrated leaflets and dimpled petioles and stems. The juvenile plants tend to have more textured foliage, while the adult leaves are more deeply lobed. As far as their performance goes, they are tolerably easy to grow. They need at least moderate humidity to do their best and prefer a narrow range of moisture. Plants that are too dry tend to drop leaves. Light: They like bright, but not necessarily direct sunlight. Older plants have handsome brown foliage, and the leaf color is affected by overall light levels. Water: False aralia prefer a steady supply of adequate moisture and are somewhat picky about it. Good drainage is essential to growing the best plant possible, but don't overwater. Soil: A peat-based mix is good, but make sure your mix has plenty of coarse material for drainage. False aralia does not do well in "sponge-like" potting mediums. Fertilizer: Feed with a weak liquid fertilizer once or twice during the growing season and not at all during the winter. They do not have heavy fertilizer requirements. Yellowing leaves might indicate a shortage of magnesium, so a bit of Epsom salts might be a good idea. False aralia are propagated by seed as well as leaf and stem cuttings. To take cuttings, use a rooting hormone for best results and keep the stem cuttings in a warm, humid place for a few weeks, until new growth emerges. For best results, it's best to place several cuttings in every final pot—professional growers often bunch false aralia together to achieve a fuller, more bush-like appearance. False aralia are not especially fast-growing and have relatively low nutritional requirements, so will likely only need to be repotted every other year. Full-size plants can reach a height of about five feet, but that's fairly rare inside. The best argument for regular repotting is to preserve the drainage qualities of your original potting media. When repotting, resist the urge to separate clumped plants—it will only damage the root ball. The main false aralia is the Schefflera elegantissima. This plant doesn't have named cultivars or varieties, so the main species is the one you'll find. Be aware, however, that the juvenile form is completely different than the mature form, so expect some variation among plants of a different age. False aralia are pretty good indoor plants. They like plenty of air movement and can handle temperatures down to about 45˚F. The main problem with colder environments, however, is the lack of humidity, so expect plants in these conditions to lose leaves unless you can raise the humidity sufficiently. They aren't picky as to their fertilizer, but they dislike too much water or being allowed to dry out excessively. False aralia are vulnerable to pests including mites, aphids, mealy bugs, scale, and whitefly. If possible, identify the infestation as early as possible and treat with the least toxic option.